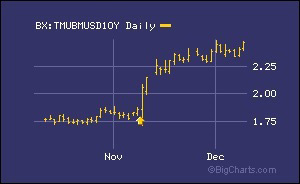 10-Year U.S. Treasury Note Yield (Bright Green) on October 3 Through Early Morning October 4, 2018 Versus Stock Prices in Prudential Financial (PRU), AIG, JPMorgan Chase, Goldman Sachs, Morgan Stanley, Citigroup and Dow Jones Industrial Average on October 3. Yesterday’s Treasury market was a mess. So was the front page of the New York Times, which featured a montage of tax records evidencing tax scams by the Trump family. We think there’s a connection. The New York Times’ 14,000 word expose and exhibits effectively render Trump a lame-duck president. That means that the country is left with the unprecedented national debt created under his big tax cuts for corporations and the wealthy along with a billionaire Emperor devoid of either clothes or the aura of a self-man man. The outlook for mounting U.S. debt pushing up Treasury yields comes at the same time that the Federal Reserve is scaling back its crisis-era purchases of Treasuries and as the European Central Bank begins this month to halve its bond purchases. The Federal Reserve, using a previously released schedule, began on October 1 to remove an additional $10 billion in bond liquidity from the market (by reducing its rollovers of maturing Treasury debt on its balance sheet from $40 billion to $50 billion). The European Central Bank has added to that loss of liquidity this month by cutting its bond purchases (Quantitative Easing) from about $35 billion to $17.5 billion. Yields on 10-year and 30-year U.S. Treasury notes spiked bizarrely higher yesterday and this morning. The 10-year U.S. Treasury note opened yesterday with a yield of 3.0644 percent and then proceeded to spike more than 12 basis points to close at 3.1873 percent, the high of the day and the highest level since 2011. The unusual spike in the 10-year continued into this morning, with the yield reaching 3.229 percent in early morning trade. The idea that the move in yields is directly connected to Trump’s fading fortunes (literally and figuratively) is supported by the way the Treasury market behaved on November 9, 2016 – the first day the market traded after Trump was elected President on November 8. The market took Trump at this word – that he would deliver a big tax cut and a massive infrastructure spending plan, both of which would balloon the national debt and likely push up interest rates since yields typically have to rise to attract buyers in the sovereign debt of a more deeply-indebted country. A sudden strange move like yesterday’s in the 10-year Treasury should have sent the derivative-laden mega banks on Wall Street and the big insurance companies, that are still living on the edge as counterparties to Wall Street’s derivatives, tanking. But that didn’t happen as the chart above indicates. (It’s within the realm of possibility that the big Wall Street banks could have an algorithm in their Dark Pools that’s instructed to buy back their own stock when there’s a sudden surge in intermediate and long-term Treasury yields.) But there could be some serious stock pain in the future for these derivatives boys as buybacks can only go so far when there is a tsunami of selling. It should also be noted that shorting the 10-year Treasury has become a very crowded trade among hedge funds as the Fed has continued on its tightening path. Typically, this would mean that we should soon see a sharp, if temporary, move in the other direction in yields as traders lock in their profits and close out positions (short covering or short squeeze). Which is to say that investors should be expecting some whiplash in volatile Treasury markets in the days ahead.